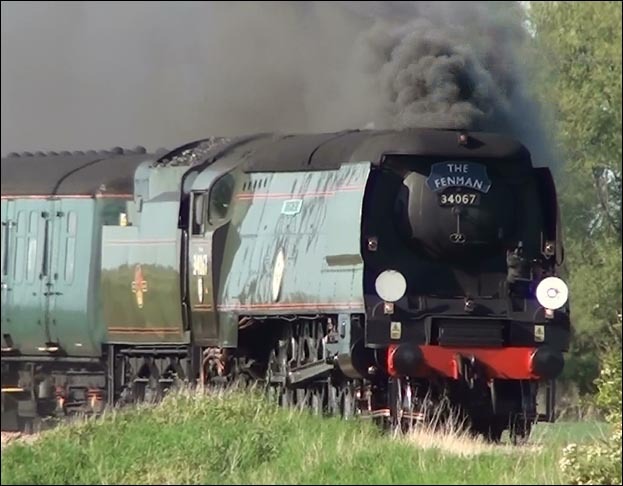 Battle of Britain class 4-6-2 Tangmere was on The Anniversary Fenman on the 25th May 2013. The train was from Kings Lynn and was heading for Ely. 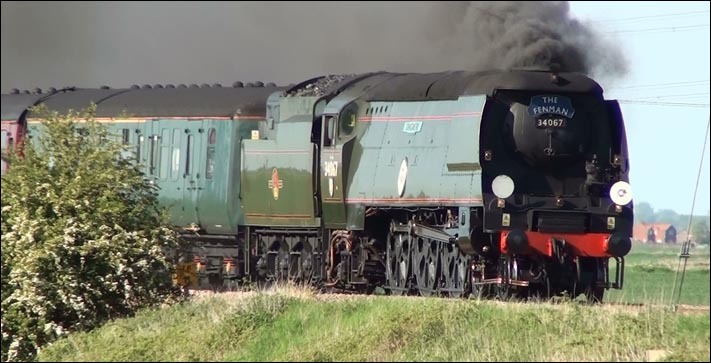 Another veiw of Tangmere with lots of black smoke. The Ely to Kings railway in Cambridgeshire line starts at Ely North Junction at the small hamlet of Queen Adelaide were the line heads out into the fens alongside the river Ouse. The the line has overhead wires that is electrified at 25 kV AC. The first station along this line is Littleport which is a large village.Class 365 EMUs are used on most of the trains from Kings Lynn to Ely Cambridge and to London Kings Cross, most trains stop at Littleport. There are just 2 platforms and a signal box left at Littleport. The Department for Transport has given the go ahead (2014?) to upgrade the Ely North Junction. The existing two single track leads onto the Kings Lynn and Norwich lines will be doubled. The signaling at these junctions is also be upgraded.